much love, illy: i'm a published poet, ya know. so i was on the phone with Ryan and had been watching the clock 'cause i had to pick up the little sister from youth group. i also had just come from having dinner with a friend at a japanese restaurant and you know how they are constantly refilling your glass at asian restaurants, so i basically drank my enter weight in water. well, this girl had to go to the bathroom baaad. when i realized the time, the following words came out of my mouth: oooh, it's 10:34, gotta go pee, and then run out the door! clever, right?! ryan definitely busted out laughing and i had no clue why - 'cause i was definitely listening to nature's call over my own poetry. so you see? i can rhyme and i am about to hit publish on my blogger dashboard. so there. published poet. ha! in other news, some of you may remember the awesome swap party we had on the blog last year, brought to you by yours truly and Sandy of Sandyalamode! we had such a good time and got such great feedback from those that participated (even people asking if we were planning to bring it back this year) that we are bringing this fun swap to blog world! you can take a peek at last year's post - but we're brainstorming, scheming, and tweaking to make it even better than last year. just wanted to put this little bug in your ear, so that you can keep a lookout for it. get excited, people, because it's gonna be gooood! p.s. be sure to enter the La Luce Designs giveaway if you haven't yet! i'm so excited for the cold hands, warm hearts!!! Such a cute idea! I wasn't around last year on blogger to know about this but I am definitely intrigued! Hopefully I'll have some money to participate in this awesome little package swap! 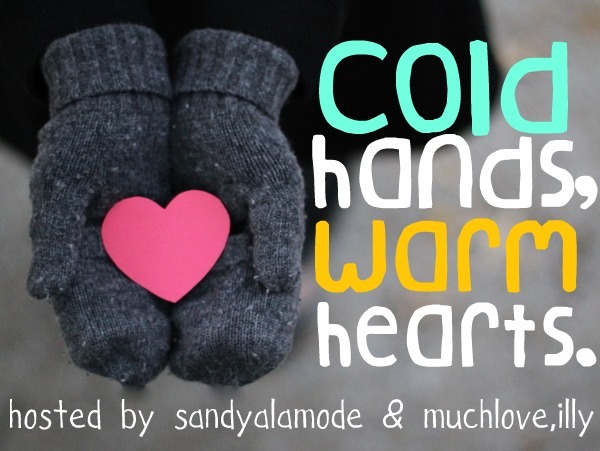 I am SO excited about Cold Hand, Warm Hearts!I didn't participate last year but I SO want to this year! Haha! Truer words have never been spoken. We shall call you Keats! 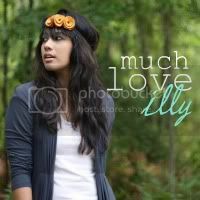 Love love love these photos of you. Great pairing with the lace top!! I'm excited to see what you have in store for this year's swap - wooo hooo!! You look amazing in these pictures! Love that top. Also love the swap idea. haha, this is hilarious! I'm fairly certain I've uttered similar words to my husband. 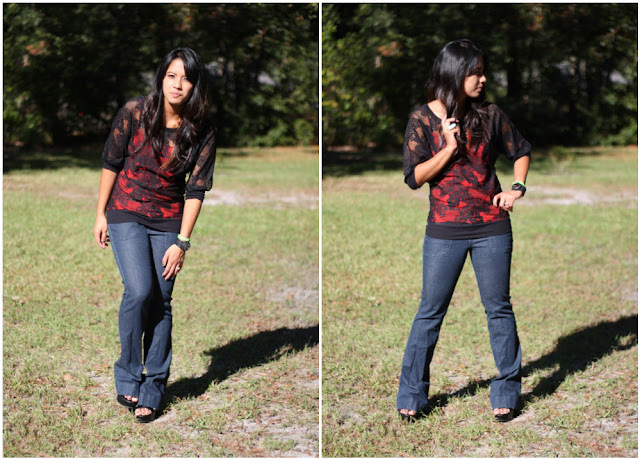 This outfit is great, your legs look a mile long in those jeans, and I love your lace top! Love these photos of you! And I love that top!!! Excited for the swap! I loved it last year and hope to do it again this year! You are a poet girl!!! And I am SO excited for Cold Hands Warm Heart to make a come back!! I was just thinking about this the other day when I had to pull on a pair of gloves because I thought my fingers were going to fall off!!! I can't wait!!!! I LOVE your lace top!!! It looks fabulous over the red top. Amazing! You look great, cute shirt! Love the top! Gorgeous and your poetry rockz! 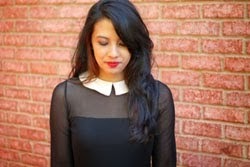 Black tace tops have endless options. LOVE. And exciting about you and Sandy's collab! yay! 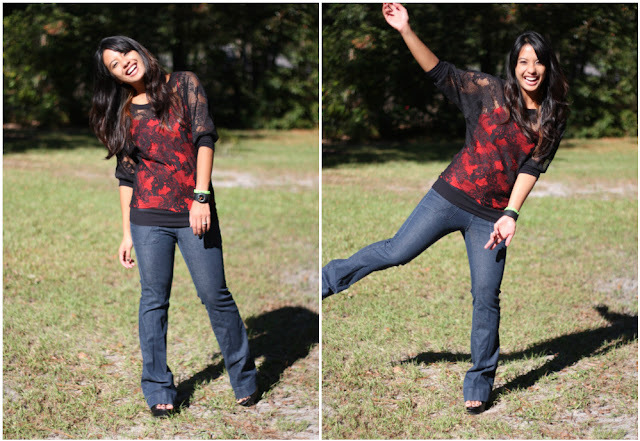 I love that lace top and you are hilarious! I can't wait to participate in the swap this year!! haha hilarious! i am totally going to start telling people i'm published - so funny!